I wired my whole home with this and have oodles left over! 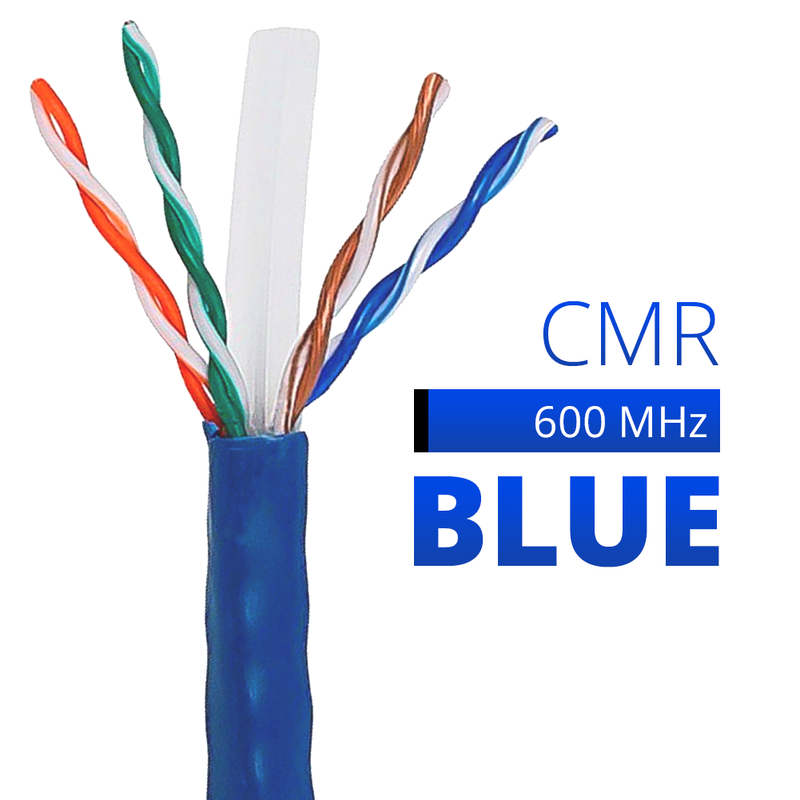 True CAT 6 cable--solid cable is a lot stiffer than CAT 5 and CAT 5e. Extremely high performance network installation. 4.300Durable, easy to pull, but quite stiff, compared to cat5. Really durable jacket though considerably stiffer than the cat5 cable I've used. Slick jacket makes pulling easy. Seems flexible pulls nice punched down well. Good product and price fast shipping. Satisfied. Difficult to connect the RJ45 Cable ends but that is because of the reinforcement built in to the cable. 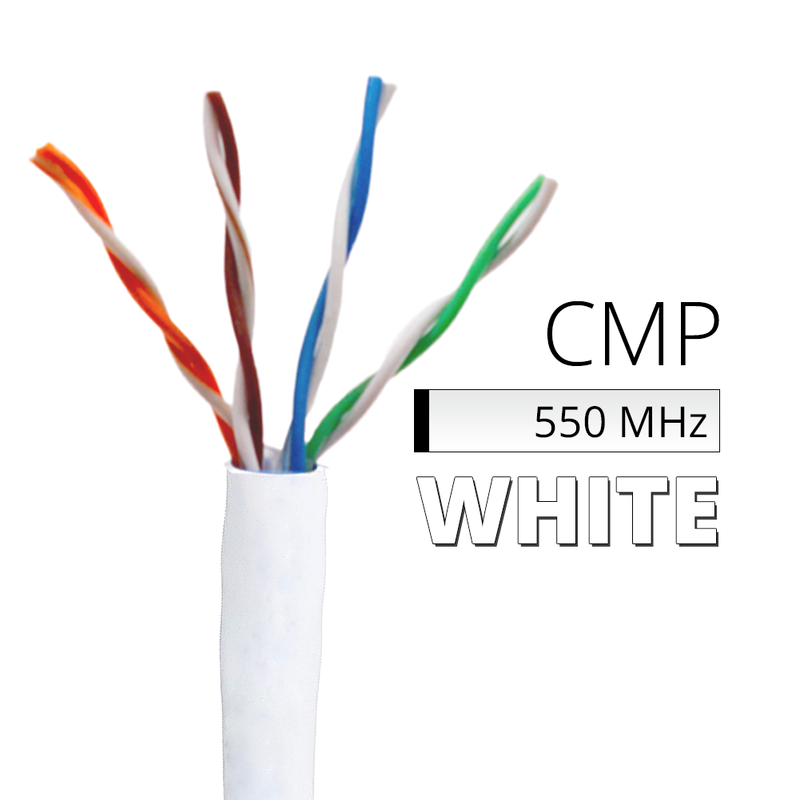 4.700Exicilent CAT6 cable. Good price. Used almost all of a 1000' box with no problems. The cable is a little stiffer that CAT5 so be prepared and make sure you match all components to CAT6. Pulled about 300 feet inside my walls for a new home build home network. This stuff works great! I have even used it for patch cables it's a little stiff but works fine. Heavy sheathing. The footage labeling is handy. The twisted pairs are stiff and hold up to bending if the insulation is intact. These ran through walls in a new construction. Was sufficient to provide 24 drops in 870 square feet of space. The speeds are excellent and do not degrade over distance The insulation inside makes it stiff so not too good for patch cable use. good quality cable. it would have made more sense to me if the cable coming out was labeled from 1ft. it is labled backward from a 1000ft and doing math backwards took a little longer. but cable quality is great. 4.500Worth it just for the quality of construction alone. This CAT6 cable is heavy duty. If you are used to flimsy CAT5 you will be impressed by the construction weight and feel. This cable is so stiff that it inherently won't bend tightly enough to compromise transmission speed that they tell you not to do anyway. The center 4-way plastic divider keeps each pair separated from the others and makes unwinding and stripping easier even though it is really designed to help limit cross-talk. The cable diameter fits snugly inside the connectors I use which means that when it is crimped together the cable really can't slide side to side inside the crimped area and yank on the individual wires causing a flaky intermittent connection. If you want to thread 10 cables through an 8 cable hole don't buy this. Excellent cable! Nice box to help install. Easy to terminate. Very good quality and very stiff. Only complaint would be pain in fingertips after making 20 or so cables but this is to be expected. I pulled a 450ft run without a kink or issue. Anyone who stated they couldn't pull without problems might have had the box facing incorrectly. It clearly states which way should be up. Quality is good price is good pull is good. No complaints here. I used the cable to connect my NVR system to my IP camera. The Cat6 was a perfect solution and was delivered on a timely basis. Highly recommended. Thank you. Cable arrived on time. It pulls easily from the box once you have the box set up look for 'place this face down' - I was able to pull cable from multiple floors away with ease. The cable is relatively stiff and doesn't appear to tangle as much as other cable that I have used - it still tangles ... just not as much. The only downside is that it doesn't have a pull thread - this means that you have to remove the outer sheath by cutting it instead of pulling on the thread to split it and you can easily cut the internal wires I did this a number of times ... so - be careful removing the outer sheath. Great quality cable with the rigidness needed to give me confidence that it won't get damaged while pulling long lengths. Came quick and was exactly what it said it was great price for the job that is now done! I haven't actually used the cable for data transmission yet but I did run several hundred feet of it. The jacket is very high quality and it has a separator which is really nice. The stuff I bought at the local orange box store had no separator and felt much less substantial. Despite being pretty stiff it was easy to run and didn't kink too easily. Will definitely buy Dyna cable in the future. Best network cable I have used. it is great for in wall use. It doesn't kink as often as the cheaper cable does. The copper doesn't feal cheap either. I've pulled about 40-50% of the wire so far as I rewire my home for Gigabit Ethernet and I've had no issues whatsoever! The product is very strong well-made and surviving well through my abusive remodeling of my home. I'm recommending this to other friends for their installs. *** About my review *** First and foremost I always check the reviews before I buy anything. Looking at the positive AND negative feedbacks is the only way to REALLY know how others felt about the same product you're considering for yourself. Thanks! It's important if you're buying this cable to be aware of what you're working with. This is heavy-gauge Cat6+ cable and that has a number of important implications. First of all it has a cross-shaped plastic separator that runs the entire length of the cable to keep the four wire pairs in the correct orientation and separation. This is part of the design but it means that you almost certainly will not be able to strip the outer jacket using a crimping tool designed for Cat5/5e cable without cutting at least one of the conductors in the process. If you don't have a cutter/stripper designed specifically for Cat6/6+ cable plan to carefully cut the outer jacket with a sharp knife and remove it by hand. Also you'll of course have to cut the center spacer short before you can fan the wires. The good news is once you've got the jacket trimmed and the conductors fanned properly for your choice of T568-A or B the stiffness of the heavy-gauge conductors makes it simplicity itself to get the cable properly inserted into an RJ45 plug. It'll slip right on with very little difficulty. So know what you're dealing with be careful and have fun. Product arrived on time cable worked great with no snags or bad connections. We use this cable for all of our network installs for customers at our business. It's rarely snagged on us when doing a wire run and has plenty of tension strength cat6 has better stiffness / shielding / pull strength compared to cat5/cat5e Tested the cable runs with our Fluke Networks NTS2-VOIP NetTool Series II Inline Network Tester $1500.00 tester and everything has perfect signal with no cross talk. Overall 5 out of 5 for the product and quality. Sturdy cable that is stiff but by design. Works without issue. Has a center divider to reduce crosstalk but makes for a stiff cable. I needed some Ethernet cable for runs to-from a new home internet wiring closet. After some research I decided to use CAT6 instead of CAT5e. In addition to providing the higher Mhertz rating the internal plastic separator helps to increase the pull strength of the cable. Very impressed with the speed of the delivery. It was almost too fast as I made a couple of mistakes in ordering. Note that there are other cable ratings such as riser-rated I only needed in-wall rated. The pull box arrived in good condition. All of the cable runs tested fine and are now in use. I would definitely recommend this product. Only very minor issue was it was not available in green color outer insulation but the blue was fine with me as a second choice. Update Jan 2016: Made some additional cable runs using all but a few feet from the box. All of the runs tested fine. Had to replace a run of Cat5 that the installer put in out of his own separate material different brand that did not test. Now looking to install some PoE IP security cameras and need to purchase another box. First time purchasing CAT6 cable have only purchased CAT5 in the past. This cable comes with a core in the middle which makes it harder to kink a good thing but since I have never purchased any CAT6 before they might all have that and it might be a requirement to be CAT6 I don't know. Shipping was fast and the packaging was in excellent condition. Purchased 1000' Black CAT 6 cable by expecting generic UTP cable. Much to my excitement the cable was much higher quality than I expected. Good thick and stiff sheath. I love the addition of the twisted pair divider within the cable. Helps a lot with noise issues. Overall love the cable and will be ordering more once I run out of this box. I purchased this 1000ft of CAT6 for a multi run install in my home. I personally have never run cable in a home and was not looking forward to this task. The price difference between CAT 5E and the in wall rated CAT 6 was maybe $10 at most and I couldn't resist a true 1GB dual pathway solution. The cable as expected as it is an UTP Solid In-Wall Rated cable stiff but has no problems running with an snake with an trap Chinese finger trap like device on the end of an snake to all corners of my house. The only person issue was the color i chose orange. Works great for the attic but my main termination in my office I just have the cables coming out the wall and the orange is an dirty orange. Basically a perfect product for doing long runs in wall/attic and 100% success on all terminations! Cable arrived as described. Using it to wire home network no issues with the cable on gigE network. The cable has a nylon spline to separate the twisted pairs but it doesn't make it too stiff or difficult to work with. The 23 AWG really keeps the cable nice and tight when my girlfriend tied me up with these cables. Since it is solid they are a bit more rigid than the stranded ables but the cables loosen up eventually and conforms to your body. I highly recommend these cables to any couple who wants to explore megabites from your significant other. This cable is very high quality cat6 cable. It has good colors on the individual wires and the center core is not too stiff. This cable worked very well for me in making over 90 patch cords for a new rack installation and I would recommend it in a second. Bought this cable to wire/re-wire my house. After the first 100ft the cable was a lot easier to pull out of the box. Cable quality appears to be good. I was looking for fast Cat6 ethernet cable that was certified up to code for in-wall installations and this was a great deal. It shipped quickly and was just as described. I was also impressed by how many colours this cable comes in. Since my reno's not finished yet the only thing I can't speak to is actual performance but considering none of the devices I currently own can fully utilize the speed of Cat6 just yet I wouldn't notice anyway.